Just like organs in your body, your teeth work without weekends, holidays, and sick days. If you want them to last as long as possible and avoid emergency visits to the dentist, you need to reevaluate your diet. Healthy eating promotes a healthy smile. Many people know that eating sweets can ruin their teeth. However, the biggest enemies of your smile are the foods that ruin the healthy environment in your mouth and stomach. A botched pH balance leads to tooth decay. Dr. Bajars from a well-known dental clinic in San Diego shared a number of foods to promote your dental health. 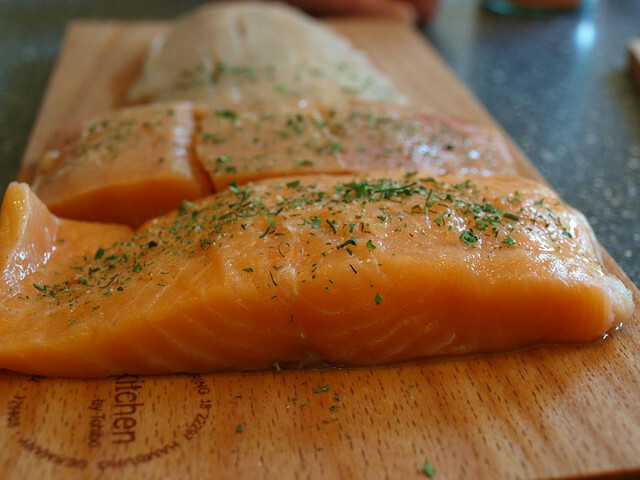 Besides being a great food for weight loss, salmon can promote the health of your teeth and gums. This tooth-friendly food contains docosahexaenoic acid that can help prevent gum disease. Meanwhile, the high phosphorus content is beneficial for rebuilding tooth enamel. Be careful when choosing crunchy foods. Don’t overdo the fruits since they are rich in sugar. Stick mostly to such veggies as carrots, cucumbers, and celery. Dairy products are not just vital for your overall health. They can keep your teeth strong due to their high calcium and protein content. Meanwhile, certain dairy products contain probiotics, which keep your stomach and intestine healthy, promoting the right pH balance in your mouth. Chewing gum is a wonderful tool for cleaning the plaque and excess food off your teeth and restoring the pH balance in your mouth. Just make sure you buy sugar-free gum. Otherwise, the high sugar content can have a reverse effect. Drinking enough water won’t just help you lose weight and hydrate your skin, it can keep your teeth white and healthy. Tap water contains fluoride to help prevent tooth decay. Meanwhile, water washes away the bad bacteria and keeps your mouth clean. If you drink enough water after each meal, you can prevent plaque formation and cavities. If you like drinking tea, you probably enjoy healthy teeth. Tea contains polyphenols that slow down the bacteria growth and prevent cavities and gum disease. One study found that rinsing your mouth with black tea for 60 seconds ten times a day helps reduce plaque. Rinsing mouth with tea is even more effective than doing it with tap water. Drinking black tea on a regular basis fights bad breath since the tea kills the bacteria producing bad smell. You won’t see a diet these days without leafy greens. The amount of healthy components they contain is overwhelming. Besides helping you lose weight, improving your mood, and nourishing your skin, they can promote oral health. The high calcium content helps build the enamel. Folic acid and Vitamin B can help treat gum disease. Almonds are rich in calcium and protein and very low in sugar. They can support the teeth enamel, help improve gum health, and act as crunchy products to remove plaque. However, almonds are very high in calories so if you are losing weight, consider keeping the amount you eat to a minimum. A quarter of a cup a day is sufficient. Cheese contains plenty of calcium as well as other minerals and vitamins to help promote healthy teeth and gums. Cheese can neutralize acids and build enamel. Eating cheese promotes saliva flow, which washes excess bacteria away. When it comes to choosing the right diet for your healthy smile, you can follow these simple rules. Thanks to the new achievements in the dental industry, such as CAD/CAM technologies, treating teeth has become easier. However, keeping them naturally healthy today is much easier and cheaper than fixing them in the future.